For more than 80 years, Grumbacher has been America's leading producer of artist's paints. Pre-Tested Oils is the flagship of the Grumbacher line, and the company's professional line of high-quality oil colors. Pre-Tested 10-Color Sampler Set — This set contains 10 colors in 0.81 oz (24 ml) sample-size tubes of Cadmium Barium Red Light, Cadmium Barium Yellow Medium, Thalo Blue, Thalo Green (Blue Shade), Thio Violet, Burnt Sienna, Burnt Umber, Ivory Black, Titanium White, and Yellow Ochre. Pre-Tested Wood Box Set — This set is housed in a beautiful cherry wood box. It contains 10 colors in 0.81 oz (24 ml) tubes, including one each of Thio Violet, Thalo Blue, Thalo Green (Blue Shade), Yellow Ochre, Ivory Black, Burnt Sienna, Burnt Umber, Cadmium Barium Red Light, Cadmium Barium Yellow Medium, and Titanium White. The set also features two Series 910 artists' badger hair brushes with seamless, triple crimped, nickel plated ferrules on short, black lacquered hardwood handles. ® Grumbacher is a registered trademark of Chartpak.™ Pre-Tested and Thio are trademarks. 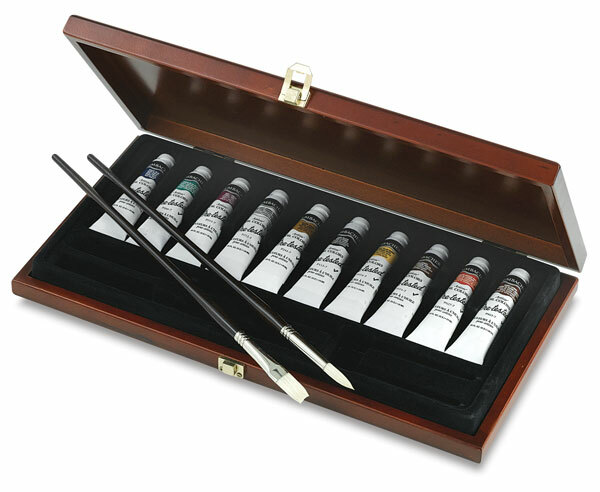 Grumbacher Pre-Tested Artist's Oils have been trusted by artists for over 70 years. They come from traditional European formulas and are made by America's oldest paint manufacturer.